fatedev.com - Hand launch models - increase grip for launch with sandpaper! The problem is simple with hand launch models, getting grip on the model to launch it. It doesn't matter if it's a Delta-wing, glider or powered model getting a grip to throw it can be difficult. Another problem is trying to be careful handling the model in the first place and if there is dew making the ground wet then after your first flight it's also slippery. 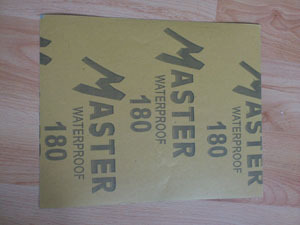 Take some very fine sandpaper, I am using 180 grit waterproof sandpaper, obviously being waterproof is important! You might also want to watch the weight of cheap sandpaper packs as often they use the cheapest backing material which is heavy, just a little tip. 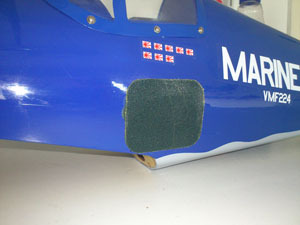 Cut the sand paper out into the patch size you require for your model and mock up the placement where you would normally be holding the model to launch it. 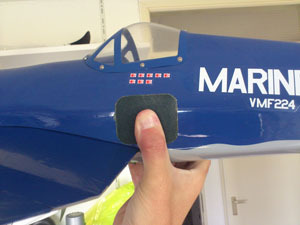 I used Bison Tix glue to bond it on the fuselage on my Corsair model shown. Looks very tidy and often you can source sandpaper in various colour to best match your model. Now for launching the oil and wet from the engine no longer effects my grip on the fuselage also I don't have to squeeze quite as hard to get a grip in the first place. On the Corsair there is a fuselage rib on the sandpaper patch area but your model may be different so think before you stick!